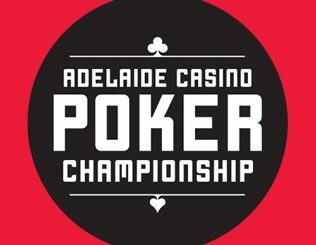 If ever there was a display that poker is truly the people’s game, it came at Adelaide Casino last night with two diverse events as part of the Adelaide Casino Poker Championship. 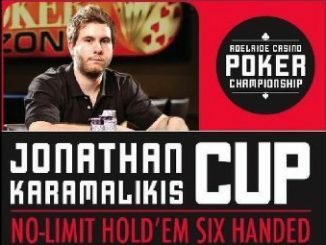 The main attraction was the $100 buy-in Australian Deaf Poker Championship, which drew a field of 70 players from across the country. Remarkably, it came down to a heads-up battle between two hometown girls – Stacey Reilly and Kathleen Odgers, with the duel lasting just two hands. Odgers open-shoved from the button before the flop; Reilly almost fell out of her chair as she snap-called and the crowd jostled for position as the cards were tabled – Reilly Ad-Ks and Odgers Kd-5s. And just as Daniel Bachi won his 2010 ADPC title, Reilly’s ace-high hand was enough to see her claim victory as the dealer spread the board of 3h-2c-9h-4d-Jd. • The evening’s second event was the $150 Pot Limit Omaha event, which drew a field of 45 runners and generated a pool of $2050. 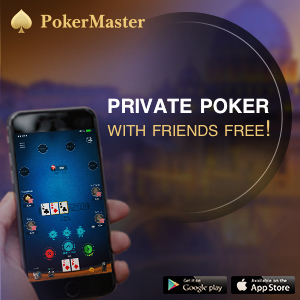 The last two standing were Joseph Matthews and Russ Ireland, with the former securing victory when he made two-pair, queens and nines on the final hand. 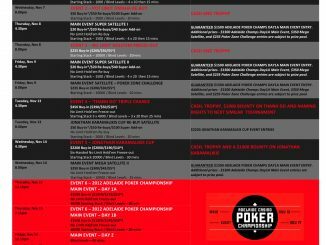 The Adelaide Poker Championship continues today with the $150 Trilogy – Pot Limit Crazy Pineapple, Pot Limit Hold’em & Pot Limit Omaha, starting at 4.30pm.